A small meat processing manufacturer, the Lundy Packing Company was built into one of America's leading pork processors by Annabelle Lundy Fetterman. Junior Achievement Born in Williamsport, PA, Annabelle Lundy was the daughter of Burrows and Mabel Lundy. Burrows Lundy had operated a small meat packing company in Berwick, PA, from the late 1920s until just after World War II. After selling that plant to a small grocery store chain, he began looking for another facility to buy or build. During this search, he decided that Clinton, NC, would be an excellent site. There were no federally inspected meat packing plants in North Carolina at that time. Burrows wanted a federally inspected plant so that he could ship pork all over the U. S.
The Lundy Packing Company opened in 1950. Annabelle had married Lewis Fetterman and they both worked at the firm. Initially, Annabelle was the office manager. She worked at the plant for its entire existence with expanding responsibilities, being named controller as well as secretary to the board. Burrows Lundy was the president and general manager until his death in 1978. Annabelle's brother, Burrows Lundy Jr. took over until his untimely death in 1980. 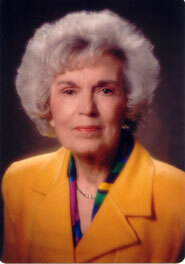 Annabelle's husband, Lewis Fetterman served as president and general manager from 1980 to 1987. 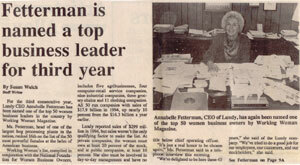 Annabelle served as executive vice president of the company from the 1980s, until 1987 when she took over as chairman and CEO of The Lundy Packing Company. The firm won many idustry awards for its marketing innovations and processing operations. In 2000, the Lundy Packing Company was sold to Premium Standard Farms. Among her many awards, she has been selected Farm Woman of the Year, named to the Top 50 Women Executives in the United States by Working Woman Magazine and inducted into the North Carolina Pork Council's Hall of Fame. The Lundy and Fetterman families have been deeply involved over the decades with helping Campbell University, including its Lundy-Fetterman School of Business. Annabelle also has served as president of the America Camellia Society, as well as many boards such as the North Carolina Symphony Foundation, North Carolina Community Foundation and the NC State University Foundation.